To overcome its influence, you must understand that karma, your internal record of all that your mind stream has experienced, controls everything, not only the major circumstances of your life, but also the smallest details of the vast panorama of life. To fully awaken, you must respect the laws of karma impeccably which rule the relative world we live in, and practice virtue while keeping the view of the absolute, the point of view of awareness in which karma does not exist. This is not an easy thing to do, but it is possible with discipline and determination. Karma Determines What You Attract. All the realized masters of all the worlds ancient spiritual traditions know: To free yourself of the influence of karma, and realize your natural state, which is the awareness of the emptiness and simultaneous fullness of life, you must clear the body/mind of the crystallized memory chips of karma which in turn act as mini internal movie projectors and determine the experiences you attract. These memory chips consist of two basic forms of crystallized thought, which are stored throughout the energy body: all of our left over desires and the resistance to circumstances in the past. Each crystallized memory carries an energy charge caused by our previous emotional resistance or clinging to numerous past experiences. It is the charges these memories carry which need to be felt and dissipated to free oneself of their unconscious influence. Crystallized memories are a perfect record of the left over experiences from previous lifetimes: a record of all of our unfulfilled desires and the experiences we resisted. Whatever you are still chasing after today or pining for; whatever you find yourself in aversion to, is what must be dealt with to wake up to the present. So many abundance seminars only teach us how to create more karma and encourage us to chase after more desires rather than dis-create them. Few know how to guide you into your real points of withheld resistance (the opposite polarity of desire) and complete them. 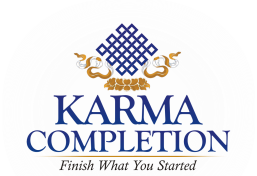 Rarely do people understand the fine line of allowing the body mind to complete it’s heartfelt desires while not identifying with them, which is the only way karma can be completed and true fulfillment experienced. At the same time, learning how to discern fantasy yearnings, the desires which distract us from our true purpose and how to dis-create them, is not a topic found in the typical abundance workshop. These omissions, are understandable due to the fact that few people have a grip on non-dual awareness, or even an inkling of what it means to keep the perception of the absolute. Due to this ignorance of the way karma operates or how to deal with its content, we remain on the wheel of life bound by the content of our own karmic quotient until some kind person helps us see through this mystery and helps bring us out of it. It is helpful to understand that karma is not our enemy. Much like our ailments or dis-ease, which operate as a temperature gage to show us where our consciousness is out of synchronization with reality, karma is simply a record of incomplete experience that will play itself out when the right circumstances arise. If we don’t pay attention when unexpectedly, particularly challenging karma arises as it usually does, we go into automatic resistance to it, which causes physical contraction in the area where the corresponding type of emotion is generally stored, and once again, as a result of this automatic resistance, it remains crystallized and is never completed. Instead, we can develop the capacity to choose consciously, to face whatever we have resisted and consciously choose to bring it up into conscious awareness and be willingly felt. Whatever desires are there can be acknowledged and addressed accordingly, rather than waiting for them to pop up unexpectedly. To do this we need to develop a willingness to look at ourselves honestly so we can begin to notice just where we are identified. The good news is, much of the dissipation of karma happens in the simple noticing and acknowledging of it. The trick is to learn how to stay awake long enough to notice it. When You Transform, You Shift The World Around You The World Needs Your Transformation.